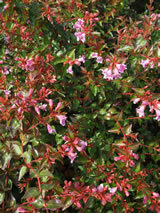 Easily grown small shrub with soft deep green foliage which turns bronze in autumn. Clusters of soft pink flowers spring through to autumn. Excellent for hedging. Hardy to cold. Plant in semi shade or sun.